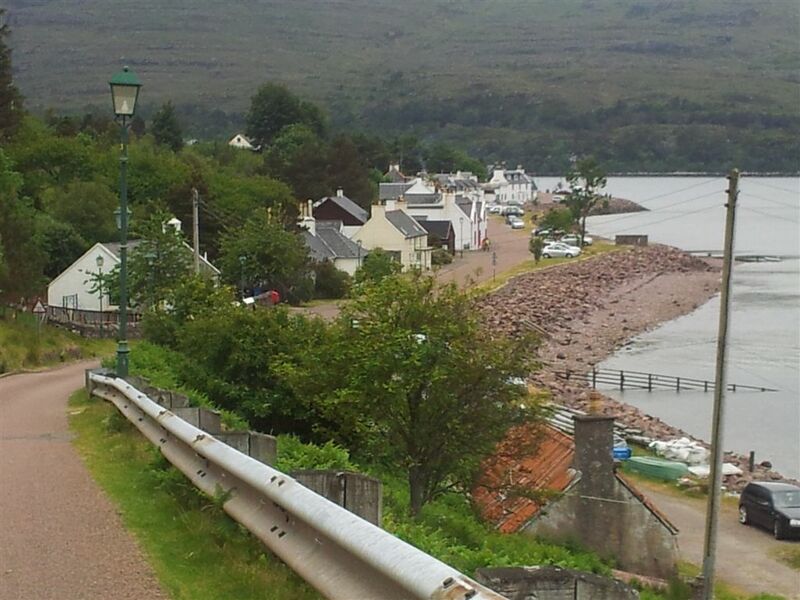 ← Driving to the North West Highlands! For various reasons this year I’ve been limited with time off work, hence a Highland trip becomes a rare holiday adventure involving not just mountains but coastal walks, views, wildlife, good food, good beer and a decent little Bed & Breakfast. The aim in June was pure fun, preferably walking under the cloud level and all crammed in to only three & a half working days off. Heres my Audioboo after leaving work at 1.30pm heading west to pick up my mate Alan (more of him later) and on to the M6 & M74 for the magical drive up to Plockton. I enjoy this drive so much I had to create it’s own page in tribute Driving to the Highlands. Happily everything went to plan this time especially the weather so after 6hrs 15 mins from Hexham including a classic photo break at Eilean Donan Castle we arrived in Plockton, half unpacked at the guest house then walked round to Harbour St for a meal at the Loch front Bistro the Plockton Shores. The evening scene was perfection, like an oil painting, the wind as still as a still thing, the Loch as calm as a calm thing. The Shores has a nice relaxed atmosphere, friendly staff and tastyfood. We were starving by then so quickly studied the many fish dishes on the menu, before ordering the duck. Now it was time to relax with the driving done, food ordered and stunning views outside. A familiar voice boomed from the next table, it was broadcaster & journalist John Sergeant dining with some younger guys. Couldn’t work out their strange technical conversation at first then sussed they were his film crew. 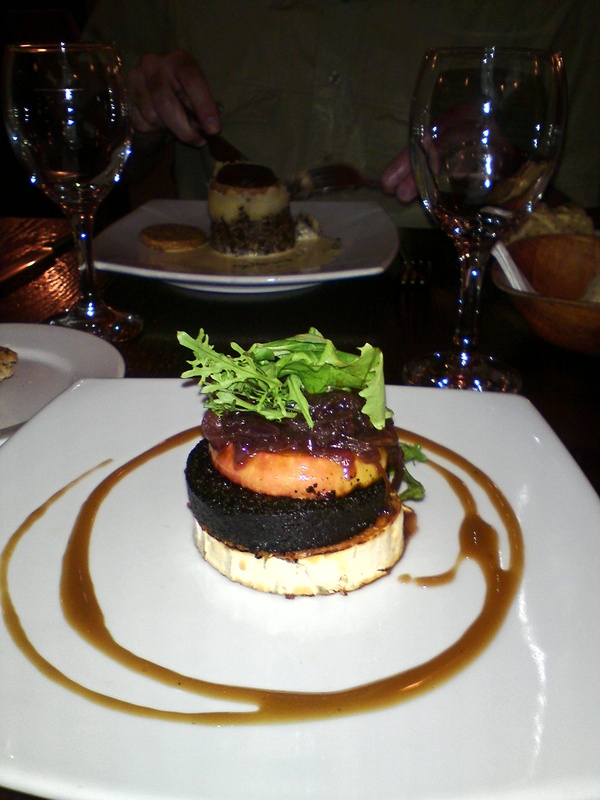 Even more interesting, our Stornoway Black Pudding, Grilled Apple & Goats Cheese Stack had arrived – and it was truly a thing of beauty – even tasted as good as it looked. 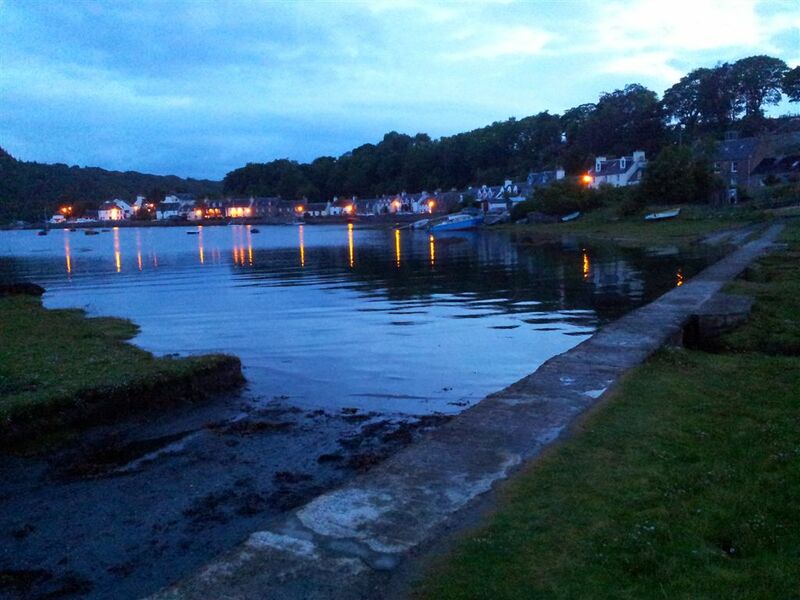 We left the Shores for the traditional evening walk across the stone causeway (crossed by Edward Woodward in the Wicker Man), past Hamish MacBeth’s police house & over to the pontoon reaching out on the Loch – a peaceful viewpoint with fading light & glistening water gently lapping, like a lapping thing. Then back down the main street, passing John Sergeant interviewing someone (apparently for the One Show). Even more interesting was a decent pint of locally brewed real ale in the Plockton Inn. Then finally back to the guest house to finish unpacking, hook up to the wireless, check the weather & plan for tomorrow. Top target this trip was Slioch, one of the Torridon giants, a huge lump of rock dominating Loch Maree. 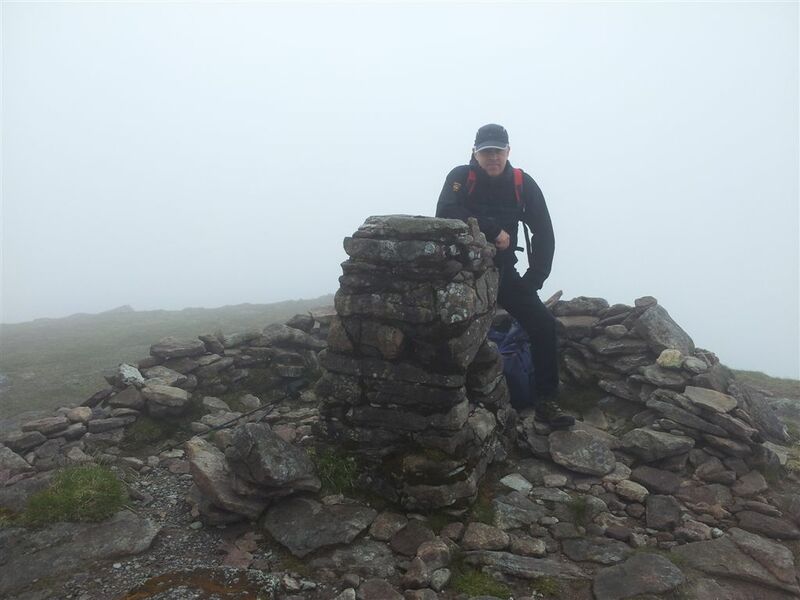 It’s summit promised views north & east over some of Scotlands most remote and prized Munros, a few of which we’d never seen before. Like all the best Munros this was one we wanted to do in clear weather though the forecast had been for a pleasant Wed evening followed by a front quickly moving north on Thurs bringing cloud gales and rain. Back in the guest house I finally got some wireless internet connection, I should point out my Smartphone o2 3g reception has been officially measured by experts as “shite”. Shite in the hills, shite in pubs, shite in restaurants, occasionally ok in certain areas within a radius of 2 feet. So finally the evening Met Office Mountain Weather forecast loaded which predictably was….wait a minute, completely different! I checked more weather sites and it looked like that front would cover most of the UK reaching Lochaber by afternoon but Torridon would be clear till evening. It seemed we had got lucky and if we headed northwards we would be in the right place at the right time, so we burst into sudden unexpected and uncoordinated rucksack-packing before getting some sleep. Next morning further weather checks confirmed it should be dry with cloud well above the summits although there were some differences over the progression of that front, but what the heck we’d decided on our number one target, Slioch, after all who knew what the weather would be like the next days so we had to grab the opportunity. Now a full fried breakfast is usually not the best thing for a long hill walk as the protein take ages to digest. 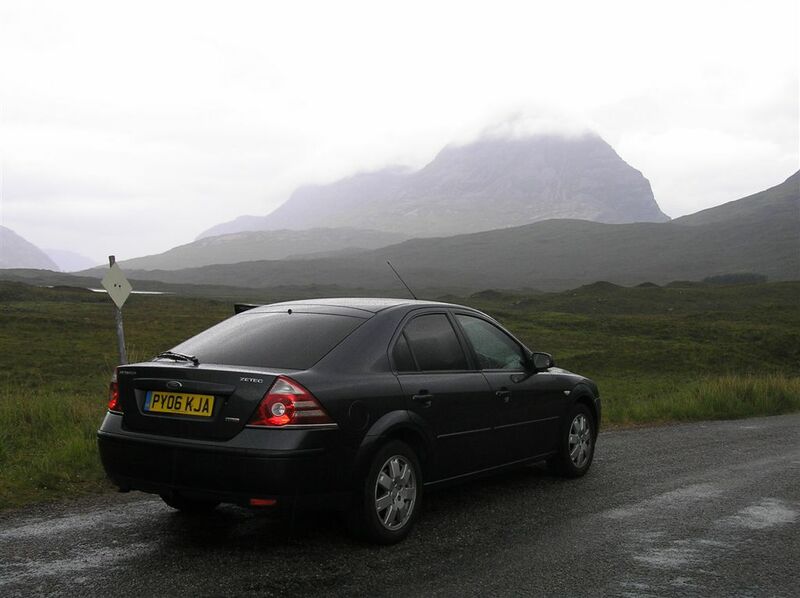 So after a full fried Scottish breakfast with extra sausages we started the drive to Torridon. Conditions however weren’t ideal and as we reached Achnasheen the east wasnt looking good at all. Torridon also had some cloud as did Slioch but I convinced Alan that things were improving and by the time we reached Kinlochewe a patch of sun sat over our route. 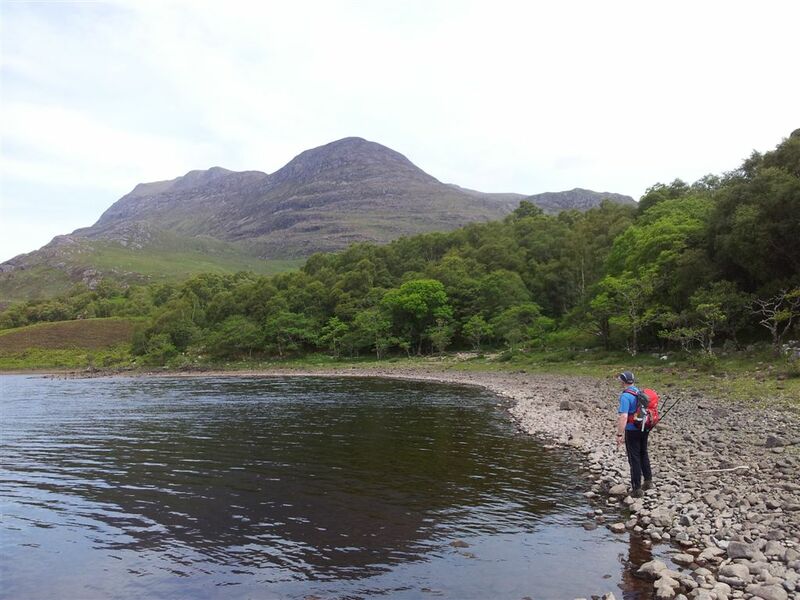 We arrived at the car park at Incheril and quickly set off on the long flat walk along the river with impressive views to the silvery bulk of Beinne Eighe, another bigger Torridon giant and another future target. 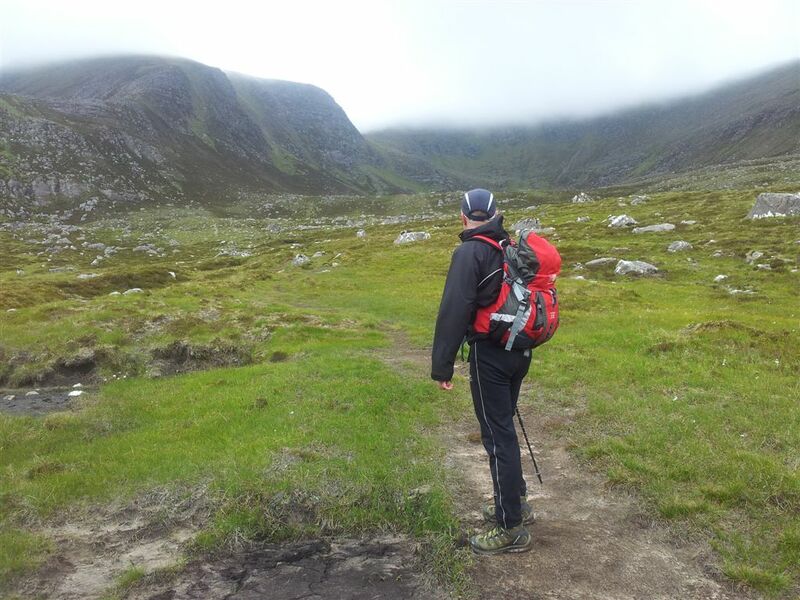 This is a great walk-in, the only downside being no height gain after 4 miles however the ascent soon revealed itself as we reached the shores of Loch Maree. Meanwhile the weather seemed to be changing and we started nervously scanning the skies. Turning right we started the slog up the mountain, the photo below looking down at where I’m standing above, (if that makes sense). There had been lots more scanning of the skies and a reluctant acceptance that the weather was deteriorating earlier than forecast. An eerie murkiness was approaching from the south and as we crested the col we could see there was still some way to the top. 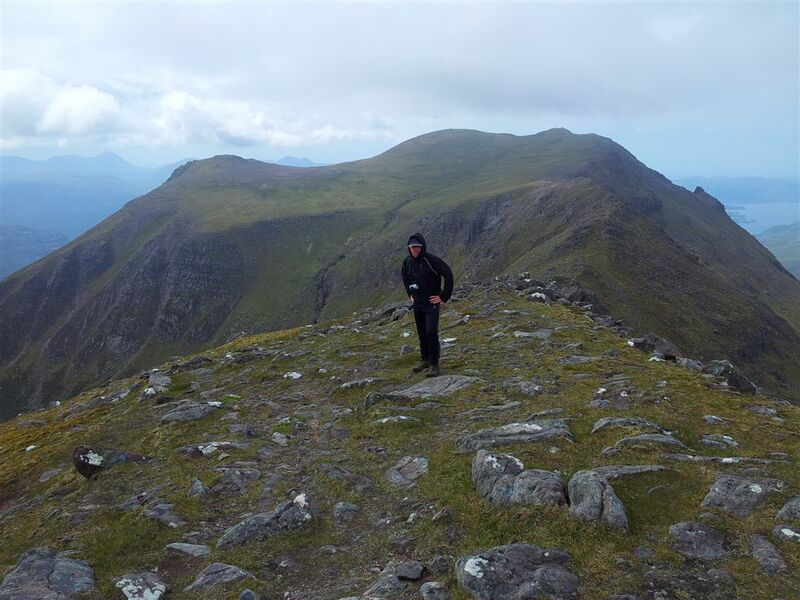 Alan made an impressive decision that we would break with the clockwise route and head east up the normal descent route to gain high ground quicker and increase our chances of views to the remote Munros. Alan was a man on a mission, he fastenend his pack and started off at speed. 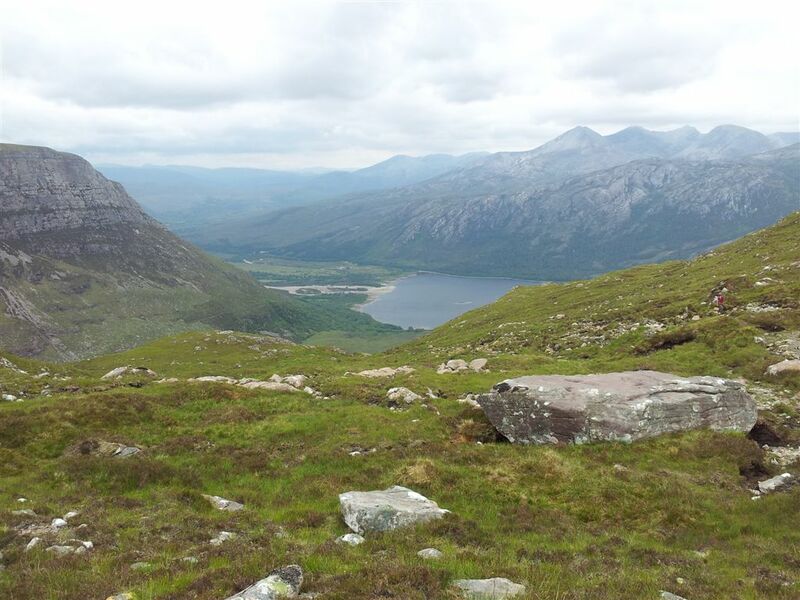 I resolved to do the same….after taking the above photo and faffing on with my phone looking for bleedin 3g. I noticed a bloke coming up fast behind and we murmured the inevitable “arweet”. He carried on along the normal route whilst I shot off after Alan across boggy land, (we would meet him later). Soon we started gaining height again and big things started to appear west. They were wonderous things, things we had read about in books, remote and lovely things. 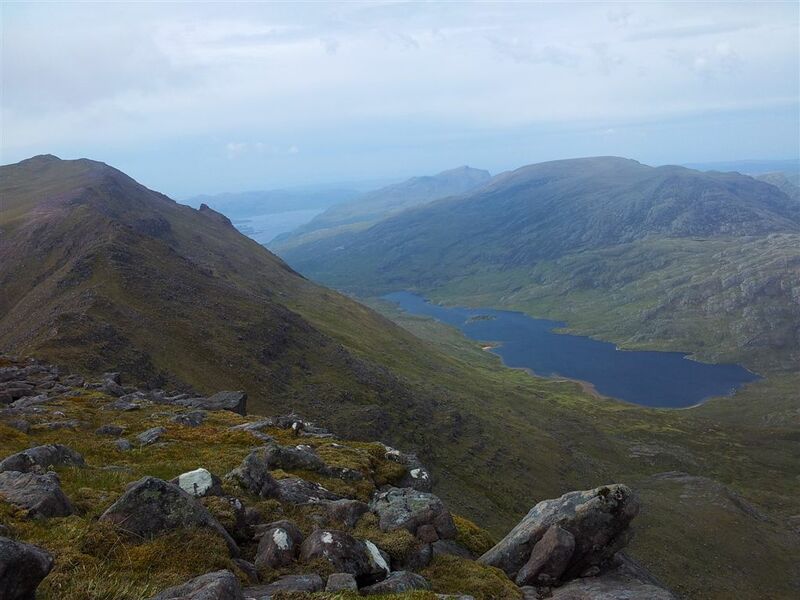 These views grew increasingly exciting as we started naming the peaks one by one, ok we got some wrong but soon corrected this as we got higher and reached Sgurr an Tuill Bhain, Slioch’s eastern subsidiary top. The view below is north to the summit with the remaining route basically following the skyline and down left. Below from Sgurr an Tuill Bhain the rollcall of magnificent Munros are from the left, our first sight of A’Mhaighdean (often regarded as the most remote Munro) and Rhuad Stac Mor in the Fisherfield Forest. Next is the incredible Corbett Beinn Dearg Mor & then in the middle distance perhaps Scotlands finest, An Teallach (a picture hangs above my settee). To the right Beinn Tarsuinn & Mullach Coire Mhic Fhearchair. All these names trip easily off the tongue, like trippy tonguey things. 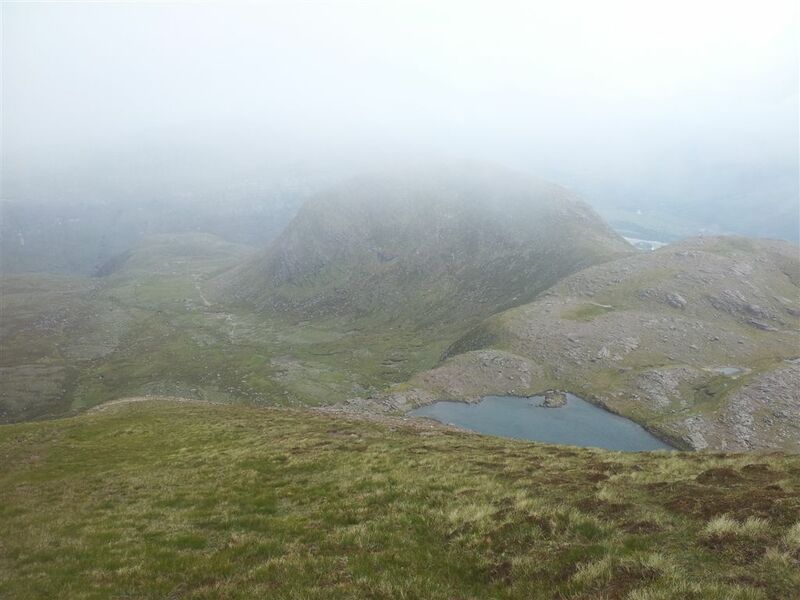 By now mist had formed on Sliochs summit, we had lost views south & west and a large cloud could be seen above my head sweeping in from the south. The weather had changed around us, five minutes later the cloud enveloped the mountain and that was the end of our views on Slioch. In some ways we had been very lucky, Alans decision to change route was inspired and we had briefly seen some wondrous sights. 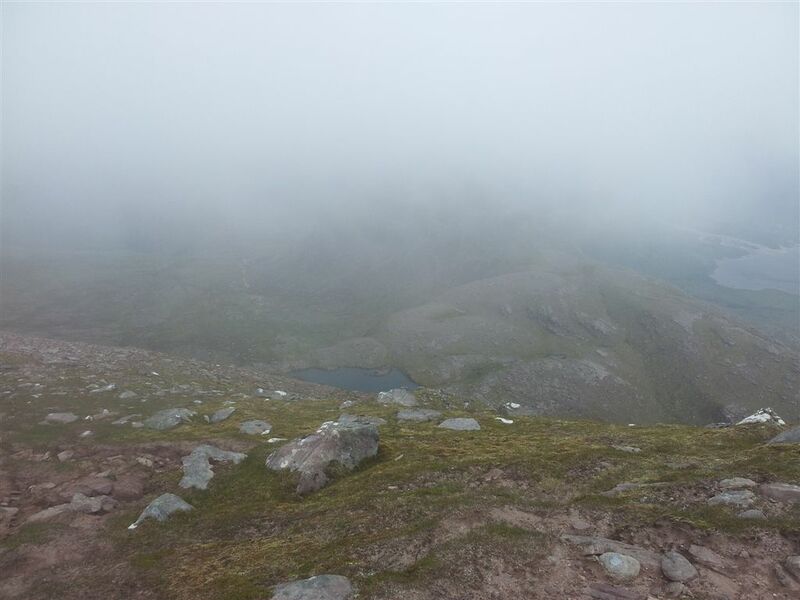 We started off to the summit when suddenly out of the mist a ghostly figure appeared. Well ok it was just the guy I’d met on the ascent who had by now made his way clockwise round whilst we were sat enjoying the sights. I was really curious so asked if he’d seen much from the summit of this mountain famed for its views. He answered glumly that he’d missed everything by 5 minutes and hadn’t seen a thing. I guess the last thing he wanted to hear was that if he’d changed route like we did he would at least have seen some of Scotlands most iconic mountains. Nevertheless in my excitement I reasoned he needed to know; thought he might be happy for us, but his face suggested otherwise. 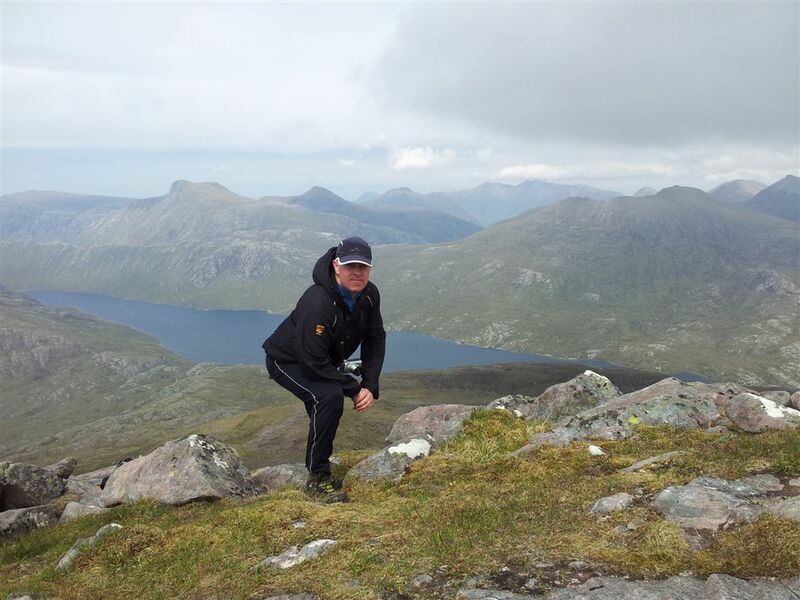 On we went around to the summit and posed for some pics on the Munro famed for its expansive views. 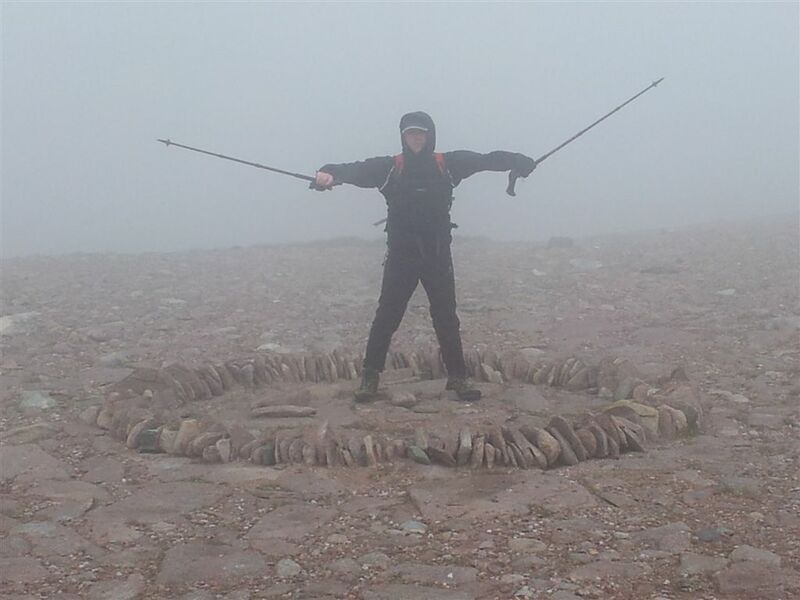 Came across this odd stone construction on the way down, cant quite figure why someone had taken the time to make this, or why I stood like that, maybe a magical magnetic force? Route down to the Lochan, time to tighten knee supports & lengthen poles, as you do! Although the weather front had hit sooner luckily the rain hadn’t yet arrived and we eventually reached the car without incident. We took the more dramatic western route back to Plockton through Torridon passing the majestic Liathac below. We called in for a quick half in Shieldaig below, always a pleasant place, the bar had developed hugely since last time we dropped in. Looked a decent potential food spot. 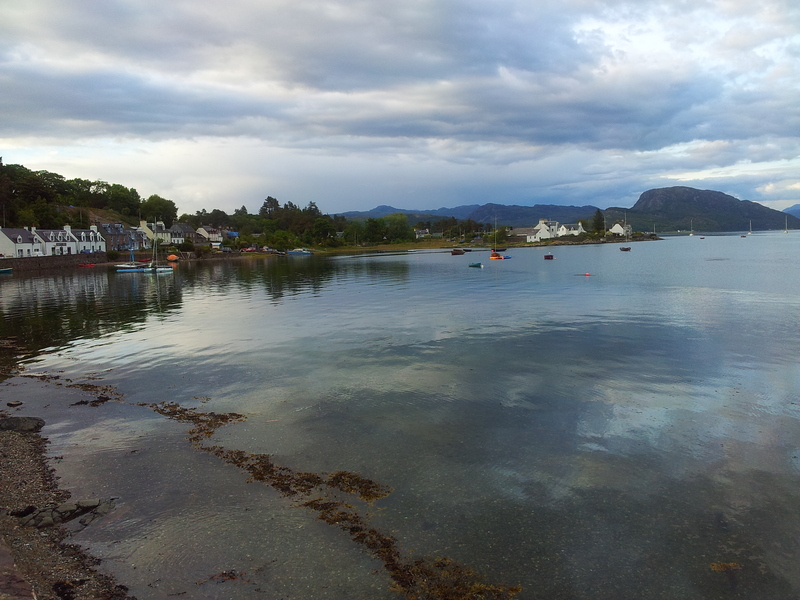 Then back to Plockton for food in the Plockton Hotel which was just as disappointing as last year, the poorest meal of the trip. That night the rain came and gales raged against the window all night, we wondered how long the bad weather would last but reflected happily on the day even though we may need to get back up Slioch again for that full panorama. Click on the map for an interactive GPS tracked route for the day…. 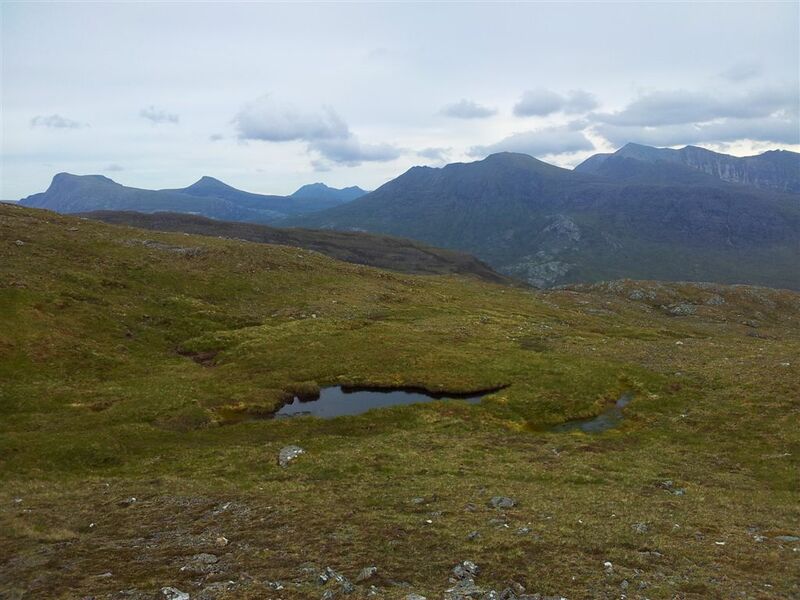 This entry was posted in Scottish Highlands & Skye and tagged Eilen Donan, Hamish MacBeth, hiking, Munros, Plockton, Shieldaig, Slioch, Slioch from Incheril, Slioch route, Social Hiking, Torridon, west highlands. Bookmark the permalink. Hilarious as usual with great photos showing just how quickly the weather changed. 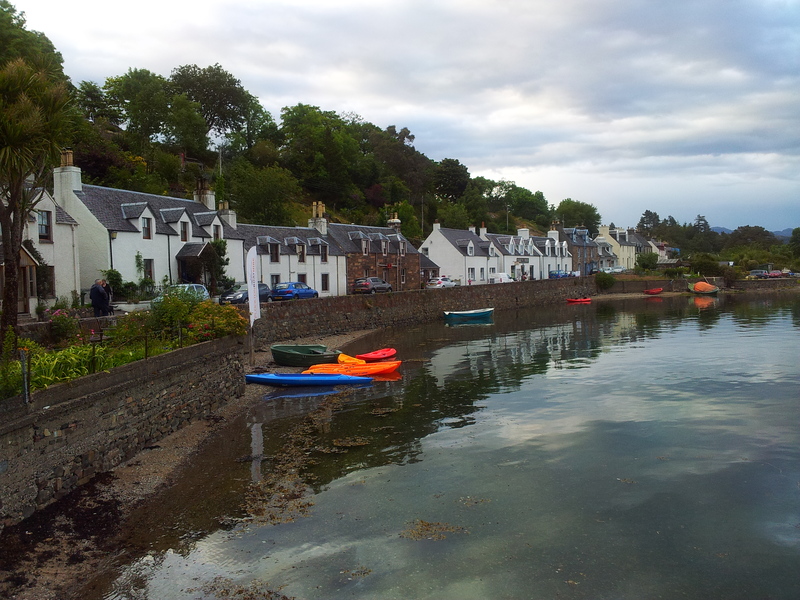 Plockton looks tiny – must be so peaceful living there (sigh). Really interesting read – plus the addition of an audioboo is inspired! Thanks Karen I’m trying to embrace the available technology 🙂 Yeah Plockton is tiny but there’s a bit more to it than what’s in the photo, simply a beautiful place. A great read Mart – you make me want to go there. And so glad you and Alan got those views. PS: Did you ever find out what story John Sergeant was covering? Lovely write up Mart and nice photos. Almost felt like I as there. Brings back memories of my trip to the Highlands early June, staying at Kingussie. Looks great! And cold when you’re in the clouds!